This is a very simple yet tasty street food dish from Thailand. 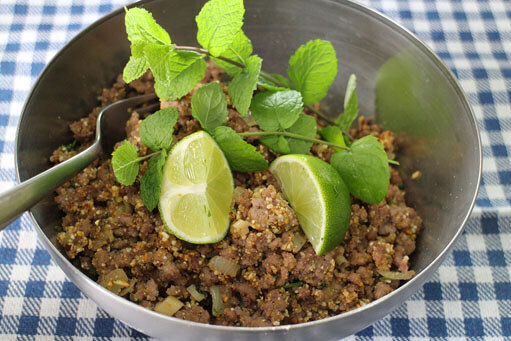 Larb (or laab, or lhab, or lahb) means pork, moo (or muu) means salad. It's quick and easy to make, and tastes delicious. The meat is normally minced pork, but you could also do this with chicken or beef. A key ingredient of this dish is khao kua, or ground toasted Thai rice. If you can't buy this, you can easily make your own. Toast 4 tablespoons of the rice in a dry pan (no oil at all) on medium heat. Stir it from time to time, and after about 15 minutes it should have turned golden-brown. Let it cool for a while, and then grind it to a coarse powder in a spice mill. Altenatively you can use a mortar and pestle. Heat up some vegetable oil in a frying pan over medium heat. Finely chop the onion and cook it until soft but not coloured. Turn up the heat and add the meat. Break it up into bits and cook until it's browned all over. Remove from the heat and add the khao kua, lime juice, fish sauce, chopped coriander, chilli and sugar. Stir until well mixed and serve hot or cold, garnished with fresh mint and lime wedges. The video above is from the Keef Cooks YouTube channel. Click here to see the video recipe of Larb Moo - Spicy Thai Pork Salad on YouTube.